Mica is commonly used as thermal insulation in electrical and electronic applications, as well as in the production of paint, rubber goods, wallboard, roofing material, drilling muds and more. Mica ores are usually found in pegmatites associated with quartz, feldspar, tourmaline, apatite, spodumene, beryl, kaolinite and limonite minerals. Scrap and flake mica used to produce ground mica are usually recovered using crushing, screening and gravity methods, and when flotation is used, the mica ore must be deslimed typically at 100 mesh. These methods tend to be inefficient resulting in significant mica losses. The recovery of mica mineral by flotation presents additional challenges such as the production of slimes during conditioning and flotation. At ArrMaz, we produce flotation process chemicals such as cationic and anionic collectors to optimize the mica flotation process while maximizing mica mineral grade and recovery. We also produce functional chemicals including flocculants, slime depressants and dispersants to improve the selectivity of the flotation process as well as final product marketability, in part by reducing the effect of slimes generated during the conditioning and flotation processes. Finally, our mining chemicals can help improve the water recycling system at the mica flotation plant by effectively settling fine tailings. 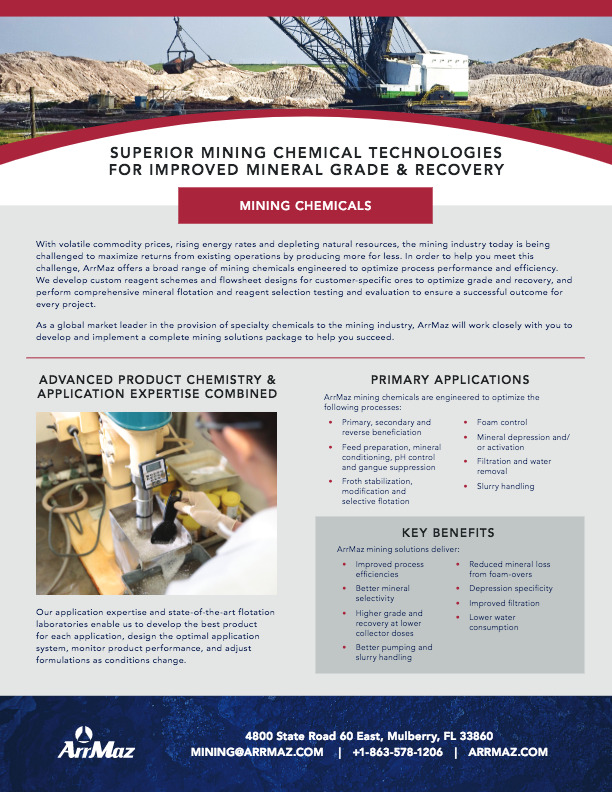 ArrMaz mining chemicals are tailor-made for each customer’s unique ore and operational scenario to maximize grade and recovery, and are compliant with all applicable industry regulatory requirements. In addition to providing design consultation to mica producers for their flotation process using our flotation chemicals, ArrMaz’s expert field personnel are also available as process advisors to our customers’ engineers, production managers and operations personnel.